What are Mixed Numbers (Mixed Fractions)? 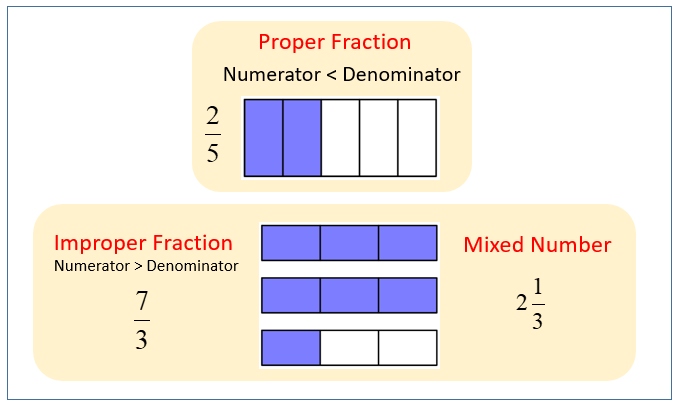 The following diagrams show examples of proper fraction, improper fraction, and mixed number. Scroll down the page for more examples and solutions on proper fractions, improper fractions and mixed numbers. How to convert between improper fractions and mixed numbers? An improper fraction can be converted into a mixed number - first divide the numerator by the denominator. The resultant becomes the whole number, and the remainder becomes the numerator of the new fraction. The denominator of the new fraction is the same as the original denominator. If there is no remainder, then there is no fraction - the result is simply a whole number.